I’ve recently tried the new Costa Lindt hot chocolate from the Christmas menu, but this is the first of the more traditional style cream topped drinks. Mint is always a nice combination with chocolate, and I was looking forward to seeing how this translated to the new Costa Mint Hot Chocolate. The drink arrived with cream and a cute little individually wrapped mini candy cane on the side. The photos on the board showed the candy cane hanging from the side of the mug, but this was still in its wrapper. I guess it makes it easier to save and have later, but it doesn't look as pretty. There also wasn't any sprinkles or sauce on the whipped cream which was a bit of a missed opportunity, it's a christmas drink so there is supposed to be opulence! The mint hot chocolate does have a good flavour though, and it was very enjoyable. The mint is more akin to butter-mint, and the flavour is creamy and smooth. It wasn't too sweet and the cooling refreshing flavour of mint was surprisingly well balanced. 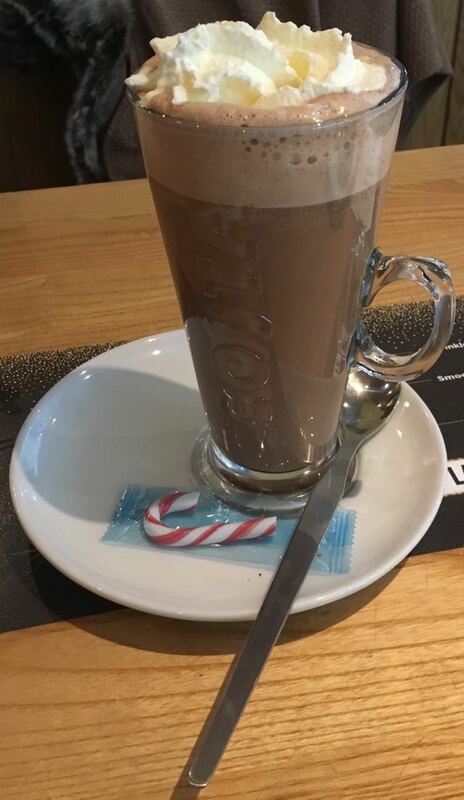 The new Costa Mint Hot Chocolate certainly works well, still a soothing drink but with a nice addition of extra flavour. The candy cane sweet is a nice bonus, and certainly gives the drink the required Christmas feel. I might still leave it a couple of weeks before putting the tree up!